Sunbrella has more uses than outdoor cushions... like patio covers. The longer we study the problem of having good shade on the patio, the more solutions we find. Cost is almost always an issue on any landscape design project. Creative thinking however, does allow for a better approach to every problem. With all the different materials available today for use outdoors, it’s getting easier to find better ways to address these challenges. 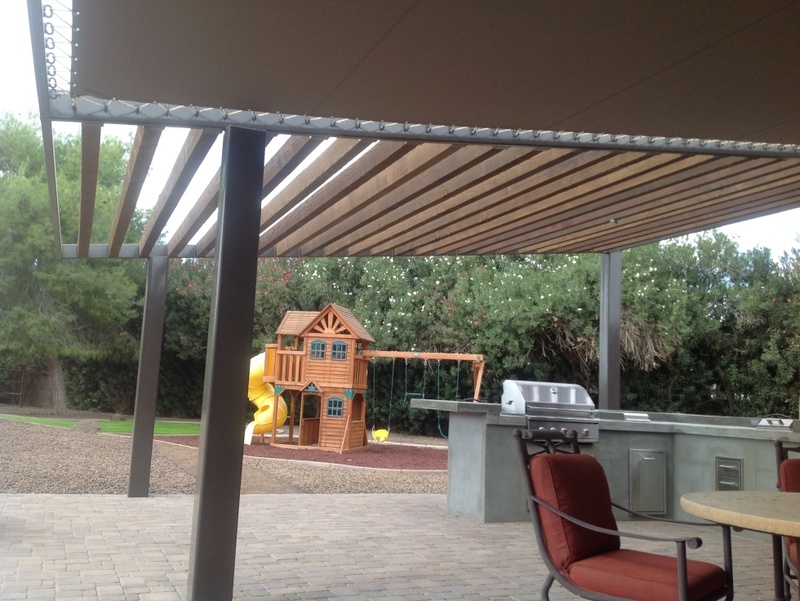 The number of roof slats in a pergola is directly related to the amount of shade it can provide. A solid roof was once the only way to get instant dense shade from these structures, but the expense is not budget-friendly. Nor is getting enough slats to cast really good shadow. 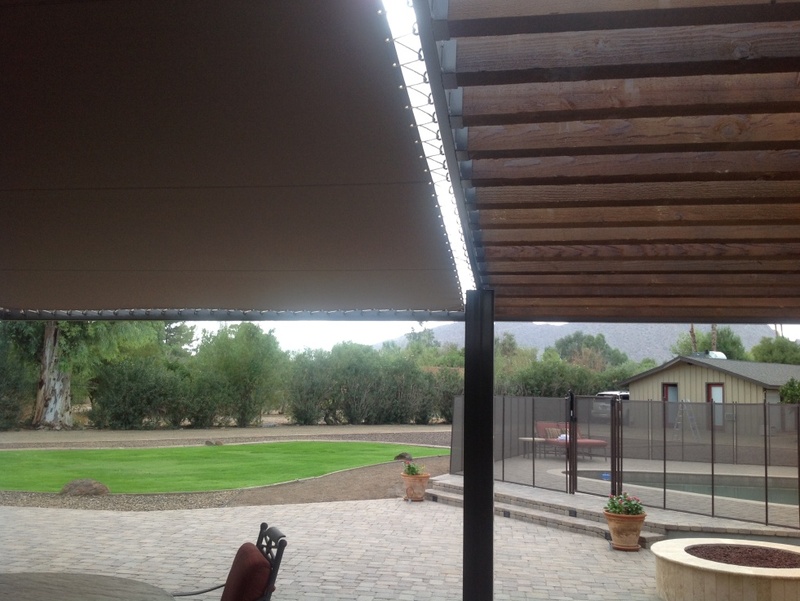 Sunbrella fabric presents us with a happy medium, and a more affordable solution to having instant shade pergolas. A stylish approach to patio shade covers. 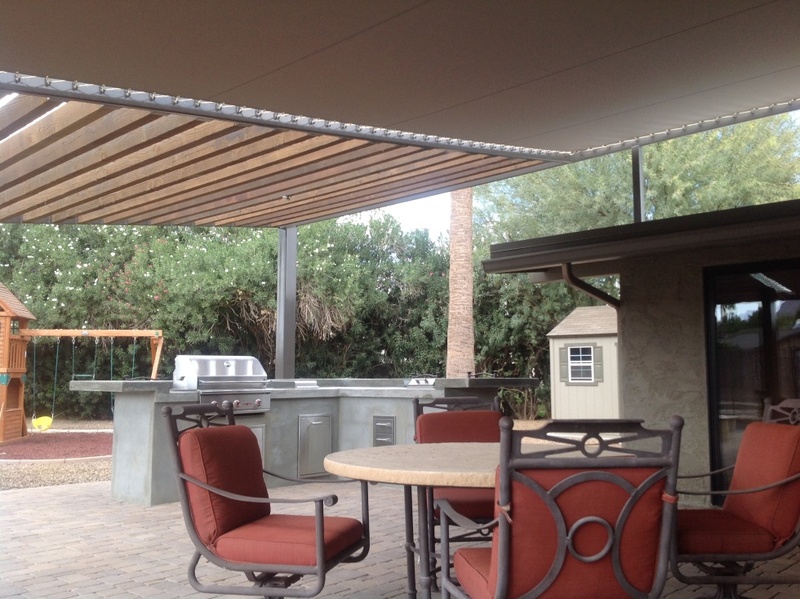 This recent Paradise Valley project has both open slat roof and Sunbrella roof pergolas. 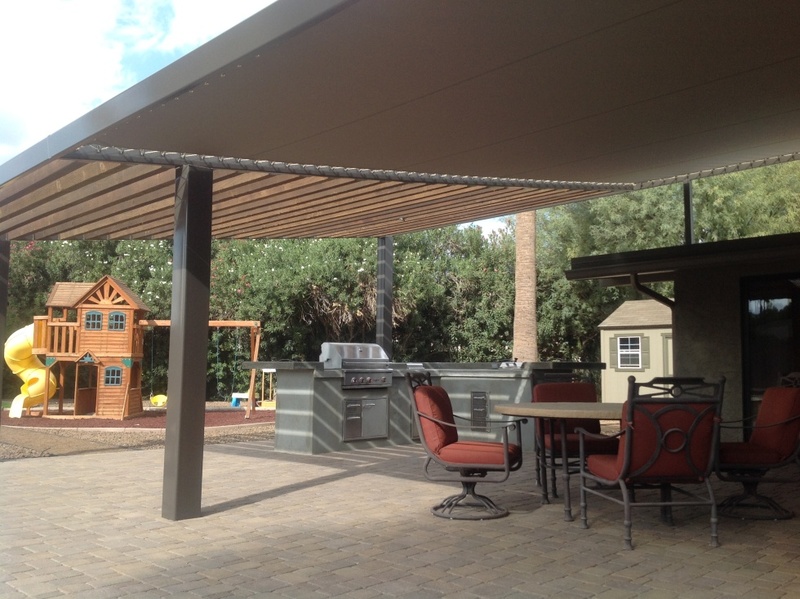 We had custom Sunbrella sheeting made to create a solid shade pergola. As you can see in the images there are no roof slats where the fabric was used. The frame and support posts are factory-finished aluminum. It’s an excellent solution to an issue to most people have in their Phoenix or Scottsdale landscaping. Sunbrella fabric comes in lots of colors, so it is easy to find one that fits the house and backyard landscaping. It’s rugged stuff too, engineered to deal with weather and sun with a guaranteed life of 8-10 years. The result is a great looking contemporary design in a low maintenance solid roof pergola. Scottsdale landscaping with more benefits that fits your budget from Desert Crest.